The Magic of a Moment. That's the theme for the contest entries I finished judging this morning from some wonderful young artists at Mesa Verde Middle School in Moorpark, CA. This was the next step in the National PTA Reflections program which encourages students to explore the arts and express themselves by giving positive recognition for their artistic efforts. Reflections is a local and national showcase for our talented children where arts and skills from many disciplines are displayed and compete for top honors. This is a chance to challenge our youth and celebrate excellence! Another magical moment is in the delivery room and today happens to also be "Operating Room Nurse Day" to honor those important nurses, who care for patients before, during and immediately after surgery. Established on November 14, 1989, Iowa Governor Terry Branstad established "Operating Room Nurse Day" to celebrate this a very important role, during a period where a patients comfort and life is in another person's hands. Even if it's just a simple, spoken "thank you", show your thanks and appreciation to Operating Nurses that you know. You can also send them a special card, Ecard or even a fun caricature like the one shown above! 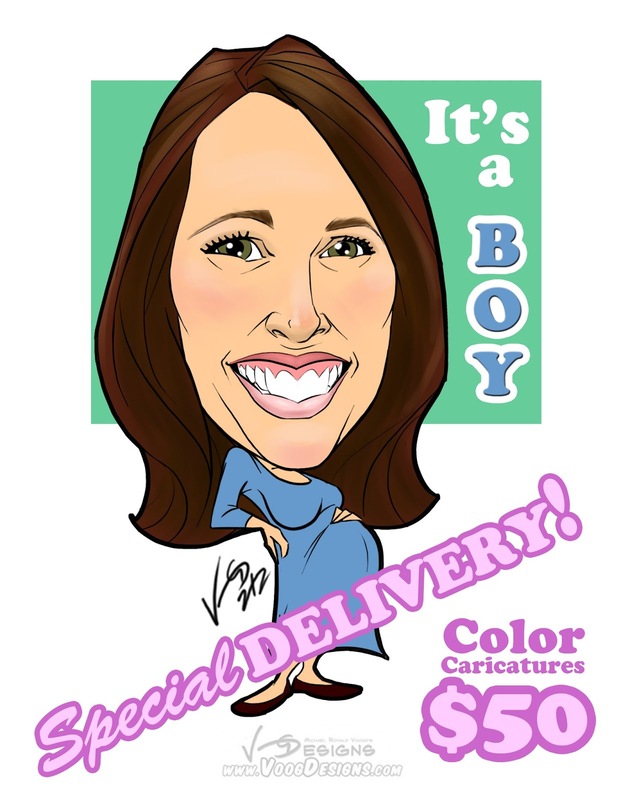 Commissioned for a friend, this caricature was illustrated to be used on baby shower invitations she was mailing out. Can you think of a magical moment that you, a friend, family member, or co-worker will be experiencing soon? 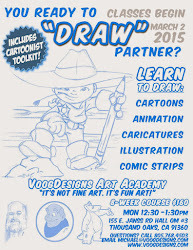 Send an email to VoogDesigns@gmail.com and let's plan a Special Delivery! "You don't know, what you don't know." Myself, like many others, thought that a "dunce" was a derogatory term for a person that lacked intellect. Well, today is all about learning as we celebrate "Dunce Day", the term "Dunce" and "Dunce Caps". So, lets get right to it and learn about it's creator. Today marks the death (November 8, 1308) Bl. John Duns Scotus of Duns, Scotland who was a medieval scholar and is generally reckoned to be one of the three most important philosopher-theologians of the High Middle Ages. Scotus has had considerable influence on both Catholic and secular thought, developing a complex argument for the existence of God, and argued for the Immaculate conception of Mary. Perceptions of his views ranged from brilliant to less than complimentary. Medieval thought was that cone shaped hats increased learning potential, and Bl. John Duns Scotus believed that knowledge would flow from the point of the cap, down and into the head of the wearer, making that person smarter. Scholar critics of his work derived the term "dunce" from his name and place of birth. Thus the term Duns Cap, or "Dunce Cap". But despite the derogatory use of the term today, there was a positive side to Scotus' use of dunce caps. It motivated the wearer to learn more, and to eventually be rid of the the cap. 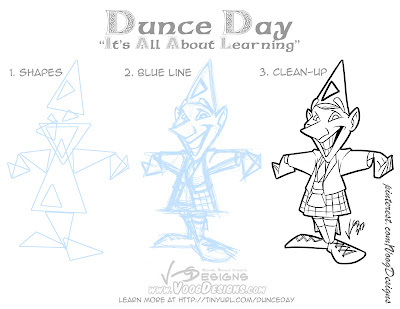 So put on a Dunce Cap today while you learn and draw this fun character. And remember that if anyone calls you a "dunce", take that as a compliment. Have a very smart and educational Dunce Day! What many see as an esthetically pleasing collaboration of lines with a funny punch line may appear like it took minutes to create. However, the speed of its creation from concept to completion is far from a few minutes. In fact it may have taken a lifetime. Just like cooking, singing, or solving a mathematical equation may seem second-nature to you, it's probably taken a good portion of your life to become proficient at doing those things. It likely didn't happen overnight. As a client, you want funny, but you may also want the comic strip to reflect your company's niche and viewpoints, targeting a specific demographic while still being sensitive to the feelings of others. Figuring out what a client wants may require a significant amount of time to understand, because they assume that you already "know" all this. As a cartoonist, we are required to be many things, and one happens to be a mind-reader (and this isn't that far from the truth!) From only a few brief discussions or emails, we must quickly catch on to exactly what the client wants. Most of the time, I'm presented with a theme, dialogue and the basic idea. 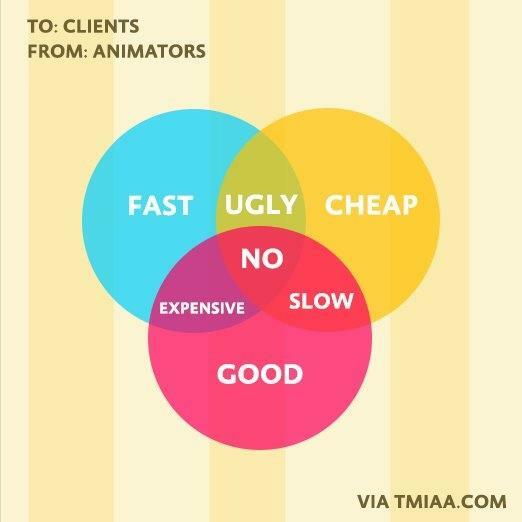 And sometimes, what the client wants may not be the best option. Therefore, EXPERIENCE, is one of the factors that are built into pricing. Clients may need to see both options illustrated in order to themselves ‘see’ the benefits and shortcomings of either. In this case I present them with alternatives to consider with my suggestions. One of my clients is a CPA, and another is a Real Estate Attorney. Try finding the "funny" in that business! But the nature of a client's niche needs to be fully understood in order to find the humor in situations which are generally only known by those in that profession. This is where I rely on my client to carefully explain to me their concept for their comic strip. Now some of my clients choose to write their own comedic material, and if you also have this inherent "funny-bone" where ideas come to mind quickly and easily, time and effort can be considerably cut down because then I can do what I do best; bring your vision to life and ILLUSTRATE IT! Art appreciation is broad and subjective. So how are cartoonists to know a client's tastes? Before discussions begin, clients are given a homework assignment; review my portfolio, style, and diversity of capabilities. For some clients, they know right away. For others, this process can take time and effort for a client to visualize their project through the cartoonists sketches. This is very normal, and most comic strip projects will go through various stages of drafts and revisions, which again needs to be factored into any pricing structure. The time one spends on any project must be taken into consideration. As with any trade, labor costs as well as parts make up the final fee. With art it's no different. The ‘time’ a cartoonist spends thinking about, researching, and sketching must be considered and given proper credit, in addition to, the beautifully executed final presentation. Art is indeed a gifted talent, but it takes practice and a considerable amount of ‘learned’ skill to be proficient enough to meet the needs of a commercial market. Digital art and the technical know-how takes time, skill, apprenticeship whether one self-teaches or studies via a college, university etc. 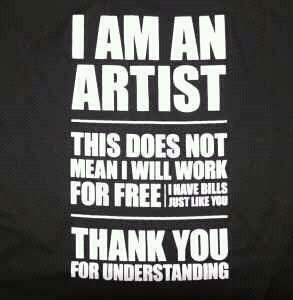 The pricing includes the skill and knowledge of the artist, much like any other profession. This process of ‘concept to creation' can take hours, days, or even weeks, but it certainly never takes seconds. As with all my clients, it is important to know your budget and I will always try to work within that to deliver a product that you are happy with. I hope that this post helps you to better understand the steps that occur even before my pencil hits the paper. The process starts long before that stage was reached and you are paying for a substantial amount of talent and skill. They come in all shapes and sizes are all "around" us. We use them when exercising, solving mathematical problems, and designing artwork. Today we celebrate, "Look For Circles Day". I could bore you with mathematical, geometrical and scientific explanations, but instead, your simple task is to open your eyes today and become aware of how many circles surround you. We suspect you will find them everywhere. Here is another fun way to celebrate "Look for Circles Day"- DRAW! 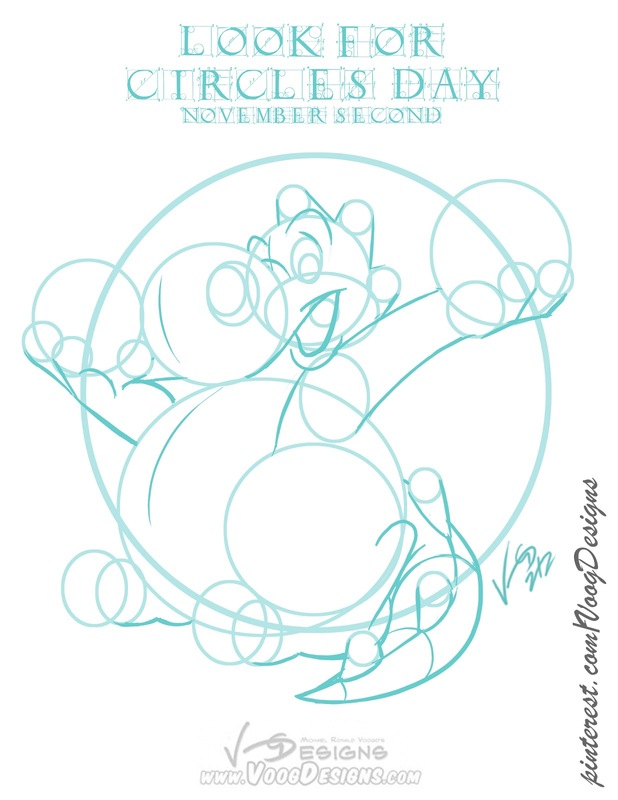 Circles are used all throughout this fun dragon cartoon. How many can you find? And, we hope that your search makes you very happy! What's in a name? What's your name? Do you know what does it means? Today we celebrate "All Saints Day", and at first, I wasn't sure what to post for today's holiday. Then me and my family attended Mass this afternoon and the homily by Father Joe Scerbo solidified my thoughts. 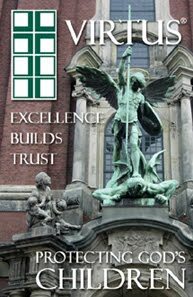 Friar Joe's homily today challenged us to celebrate our patron saint and connect with them by exploring the virtues they're associated with. Some may question the belief that our names can determine our destiny. Hey, I know it's not for everyone, and just because you are named "Rich" doesn't mean financial security. This was proven and disproven in the movie "Freakonomics". For me personally, I feel that there is something to the name that I was given. Whether it's our birth name or baptismal names. My first name is Michael, and I have always been "drawn" to art. I love ART! Drawing, painting, music, carving, sculpting, even haircutting (YES, the next time you get your haircut, realize that every person has a different type of hair, and styling your mop is an art form. At one point in my life I almost became a police officer. Now that's a change of scenery isn't it?! But I am also empowered by the warriors way. I have always been interested in the martial "arts". At a young age I even earned my own money to pay for my karate lessons. Later in life I discovered ninjutsu and after almost 5 years of concentrated training, finally earned my shodan in ninpo taijutsu. I've always known that St. Michael was a warrior defender, but it was only today after researching him further, that I discovered that he is also the patron saint of artists! Go figure! So today I celebrate "All Saints Day" with this comic that I created for my parish. And although it's been said that "the pen is mightier than then sword," I choose to be proficient with both.